The Good Demons are a "fresh" contemporary jazz trio. Their music combines elements from jazz, progressive, fusion, pop, rock. They are inspired and influenced by a large and diverse musical combo that combines Steve Vai, Miles Davis, Faith No More, Tribal Tech, David Bowie and Coltrane. Well ok… the final outcome can be considered as jazz but never the less "Good Demons" is a project that follows the personality of each member. It is a journey to discover the happiness deriving from playing the music that satisfies the members of the band and the music that influenced their musicality! 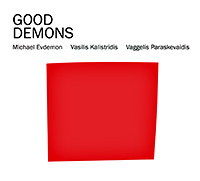 Vasilis Kalistristris plays drums, Vaggelis Paraskevaidis plays vibes and percussion and Michael Evdemon plays el. Bass and composes the whole material. The Good Demons have recorded their debut album which includes 11 original compositions. The album also features 4 amazing guitar players: Vasso Dimitriou, George Stavroulakis, Thodoris kotsifas and Irene Ketikidi. Click here to stream via the free Bandcamp app plus high-quality download in MP3, FLAC and more.